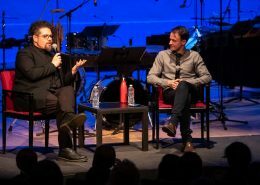 In a recent New York Times essay prompted by Lincoln Center’s Mostly Mozart Festival, Anthony Tommasini began by stating, “Where a concert takes place can be as crucial to its success as the quality of the performance itself.” Whether he was referring solely to the physical space of a concert hall itself, or to both the physical space and what such a space means for categorizing a performance, however, is unclear. He later suggests that “it’s not quite clear what Mostly Mozart stands for,” in light of its increasingly diverse programming. At a certain point, however, the relentless need to categorize, segment, and name every single performance piece that happens – under the auspices of Lincoln Center, and beyond – becomes futile and feckless. 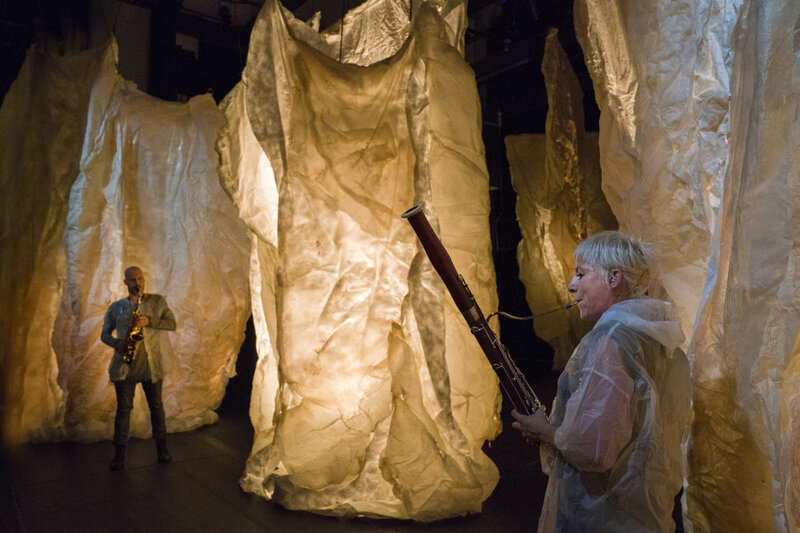 God help the critic who tries to codify a Mostly Mozart offering written by a 35-year-old American composer, billed as an “opera for objects,” and produced by Lincoln Center in Brooklyn. 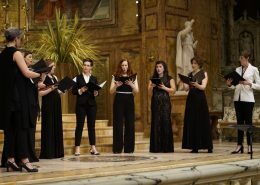 Yet Ashley Fure’s The Force of Things, performed by members of the International Contemporary Ensemble at Gelsey Kirkland Arts Center in Dumbo, could be one of the truest operas Mostly Mozart has produced in its 51-year history. By the time Mozart was born, the Florentine Camerata members of the late 16th and early 17th Centuries were long gone. Yet their vision for returning to the roots of Greek tragedy, fueled by the intention of improving the state of society, had left Europe with the operatic form. This was, practically speaking, the vision of dramas being acted with music. Delving more extensively into Ancient Greece, though, the theatrical roots stretch deeper – tragedy was a means of using drama to better understand the human condition. And what is at the root of the human condition? Going further back into history, this dramatic form came out of religious rites within Ancient Greece, most notably the Eleusinian Mysteries performed by the cult of Demeter and Persephone—a cult, it’s worth noting, that was open to all genders and social stations. The Mysteries culminated in an annual pilgrimage to the Telesterion at Eleusis: a space that gives us the contemporary model of theatrical architecture. In a proto-Burning Man experience, initiates drank a psychoactive elixir known as kykeon and experienced a collective awareness, a state of pure presence. This was the first documented experience of theater, before it grew into the era of Aeschylus and Sophocles, and long before stories of Figaro and Don Juan were used as means to the same ends of experiencing presence and mining the human condition. Without a pre-set plot or at times even an audible score, The Force of Things brings us back to these initial impulses that served as the blueprint for over four centuries’ worth of opera. In introducing the premiere to the first of two opening-night audiences, Fure noted that “our bodies are evolutionarily built to ignore” the slow-burn of threats like global warming, the “mounting hum of ecological anxiety around us.” We then come full circle as active participants in Fure’s work, challenged to “shake in fear” over the earth’s core temperature rising by a single degree. The actions of shaking and sounding are also intimately linked: we constantly are vibrating with the operations of our organs and internal systems. We are, in this sense, a walking, breathing environment of musical drone—a notion John Cage famously observed in 1951 when he entered an anechoic chamber at Harvard. In a room sealed off from echo and reverberation, Cage still was incapable of experiencing true silence. He later learned that the sounds he was hearing were from his nervous system and blood circulation. Over time, however, human progress has made it possible to listen to any number of Mozart recordings from the last century. 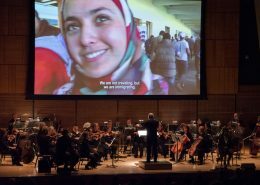 It enables a reader in Ljubljana to read about a concert in New York—or, depending on the medium, to follow the event in real time. But with the wealth of information now available to us, what is most important? And are we missing it? What would it mean for us as humans to re-attune to the frequency of our internal drones? Would greater self-awareness allow us to understand those around us more easily? How does such an environmentally-driven sense of focus – what Pauline Oliveros termed deep listening – come about? Environment is the other driver of The Force of Things. 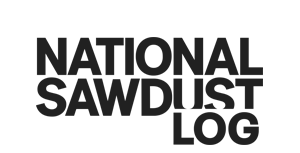 This element is orchestrated by Fure’s brother, the architect Adam Fure. In order to accommodate an act of deep listening, two dozen subwoofers, all aimed upward, vibrate at a frequency of 10.67 hertz (for reference, most of the important sounds we hear in a day range between 250 and 6,000 hertz). It’s a rate of oscillation that the human ear can’t readily identify; what we can hear are the reverberations caused by these tones. We hear the ripples of paper and plastic triggered by strings tied to the subwoofers—a show-don’t-tell of sonic vibration. Two voices, aptly described by Fure as Greek chorus-like figures, beckon the audience inside the nucleus of the space. Seating is arranged within the center, clustered around a quintet of subwoofers. If it all sounds a bit like Plato’s Cave, this, too, seems by design. In asking how we may shake in fear over “timescales impossibly out of sync,” what Fure is also asking is how we might understand the disconnect between our perceptions of the world, our perceptions of ourselves, and the true nature of both. The act of listening is an act of communion, a path toward presence. Fure guides us towards presence with sounds that use materiality, in its rawest form, to capture a sense of the immaterial. At the onset, papers moved over one subwoofer by saxophonist Ryan Muncy call to mind helicopter blades, an Apocalypse Now–like ethos matched by wordless prayers chanted by Lucy Dhegrae and Lisa E. Harris through megaphones that sometimes hint at shofars. Chimes and woodwinds come into the mix as well, but always in interaction with their raw materiality versus the polished vision that has guided concert music over the last few centuries. With so much aural anxiety in the unknown, amelodic, and primal, Fure’s meticulous score travels in the same footsteps of Shostakovich at his most political and fraught—what one might expect if that composer were resurrected in 2018, shown a smattering of news headlines, and then loosed in Harvard’s electronic music studio (where Fure studied). 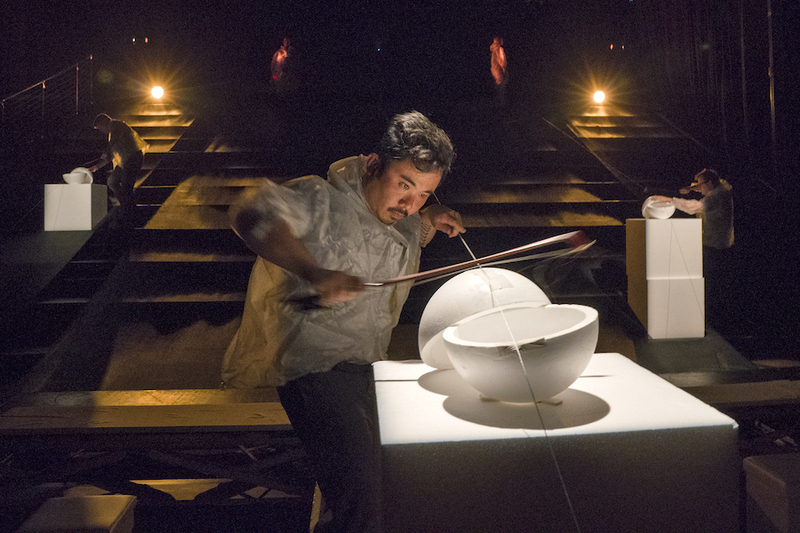 A point in the work’s second half features the ensemble bowing airport cables that stretch across half the space, creating a breadth of repetition that, combined with an omnidirectional bowing technique, takes on the ethos and fervor of religious rite — percussionist Levy Lorenzo’s motions evoking the sign of the cross or flinging of incense. Such calming, cadence-setting rituals fly in the face of the low rumble of total annihilation that builds over the course of 50 minutes. This isn’t heartfelt music; it’s spleen-felt. It lodges deep in the gut, gradually building into a low-grade panic. If the Eleusinian Mysteries were meant to summon Dionysus, the Greek god of wine and ecstasy, then The Force of Things invokes Oizys, the goddess of anxiety and distress. While Fure wants us to shake, however, The Force of Things seems built to accommodate an ebb and flow between concentration and contemplation—all roads lead to upheaval. Fure first leads us into the space of contemplation (a word with origins in the 1580s, which derives from the Latin for “with” and “temple”), a literal temple for a quiet riot of a rite. Aptly enough, the first noted use of “concentration” (“with” + “center”) comes a few decades after “contemplation.” We first were trying to put to a material description the act of being led into a temple of consideration and observation, before trying to name the act of bringing that presence to a common center. So too do we move toward the central focus of The Force of Things only after entering both the physical temple of the performance space and the allegorical temples of our psyches. Beating both “contemplation” and “concentration,” incidentally, is the word “composer,” which dates back to the early 1400s and pairs “with” and “place.” In laying down the score of The Force of Things, in placing the elements together just so, Fure leads us into our respective individual temples. Where we end, spatially and sonically, is in a collective awareness, clustered around five of the work’s two dozen subwoofers. 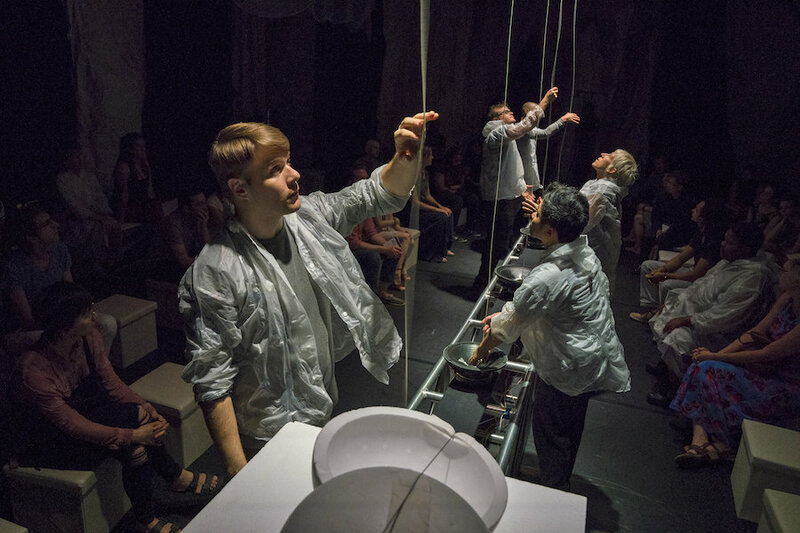 As the performers manipulate the strings in their natural orbit, each string snaps one-by-one in the face of human interference. The middle string the last to go. We end in the center. Where a concert takes place can be as crucial to its success as the quality of the performance. Where it ends, however, is even more crucial. 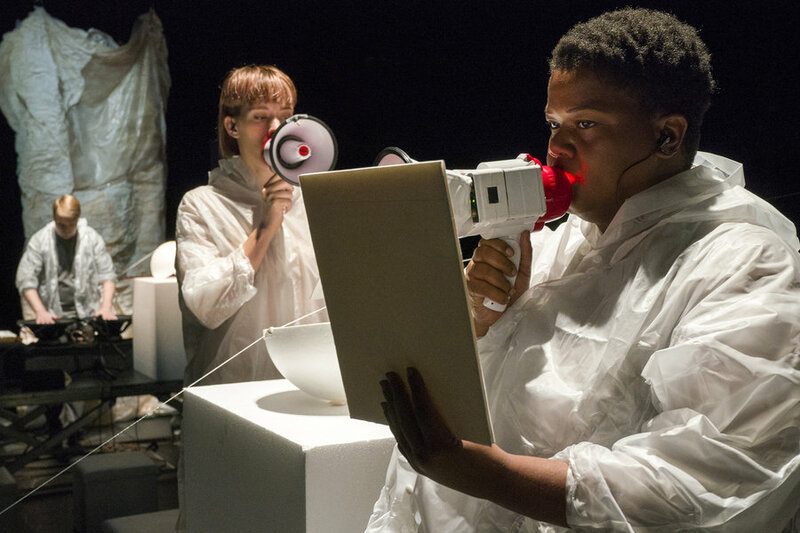 The Force of Things repeats at the Gelsey Kirkland Arts Center in Brooklun on August 7 and 8 at 6:30 and 8:30pm; lincolncenter.org. Olivia Giovetti has covered music and arts for Paper, the Washington Post, NPR, VAN, and beyond. She’s previously served on staff at Time Out New York and WQXR/Q2 Music, and her writing has been heard onstage at the Brooklyn Academy of Music as part of the Next Wave Festival. She combines her love of the arts and meditation practice on The Meditation of Art.